The PHRED instruments DeadBolt gets its inspiration from Steve Cripe's Lightning Bolt, one of the iconic guitars played by Jerry Garcia in the 1990s. The body features a triple humbucker setup mounted in a custom pickup plate, with discrete split coil switches and a 5-way pickup toggle for 14 different tone combinations! DeadBolt is professionally setup with low action and D'Addario 10-46 strings, and the frets are leveled and milled here at our shop in California for a nice smooth and clean feel all around. The PHRED instruments DeadBolt Honey Brown gets its inspiration from Steve Cripe's Lightning Bolt, one of the iconic guitars played by Jerry Garcia in the 1990s. The body features a triple humbucker setup mounted in a custom pickup plate, with discrete split coil switches and a 5-way pickup toggle for 14 different tone combinations! DeadBolt Honey Brown is professionally setup with low action and D'Addario 10-46 strings, and the frets are leveled and milled here at our shop in California for a nice smooth and clean feel along the edge of the fingerboard. The PHRED instruments Liger gets its inspiration from Doug Irwin's Tiger guitar, one of the iconic guitars played by Jerry Garcia. The body features a triple humbucker setup mounted in a custom pickup plate, with discrete split coil switches and a 5-way pickup toggle for 14 different tone combinations! Liger is professionally setup with low action and D'Addario 10-46 strings, and the frets are leveled and milled here at our shop in California for a nice smooth and clean feel all around. The PHRED instruments Phredo features a triple humbucker setup, with discrete split coil switches and a 5-way pickup toggle for 14 different tone combinations! Our Phredo is professionally setup with low action and D'Addario 10-46 strings, and the frets are leveled and milled here at our shop in California for a nice smooth and clean feel all around. The PHRED instruments Black Wolph gets its inspiration from Doug Irwin's Wolf guitar, one of the iconic guitars played by Jerry Garcia. The body features a triple humbucker setup mounted in a custom pickup plate, with discrete split coil switches and a 5-way pickup toggle for 14 different tone combinations! Our Black Wolph is professionally setup with low action and D'Addario 10-46 strings, and the frets are leveled and milled here at our shop in California for a nice smooth and clean feel all around. The PHRED instruments Blue Wolph gets its inspiration from Doug Irwin's Wolf guitar, one of the iconic guitars played by Jerry Garcia. The body features a triple humbucker setup mounted in a custom pickup plate, with discrete split coil switches and a 5-way pickup toggle for 14 different tone combinations! Our Blue Wolph is professionally setup with low action and D'Addario 10-46 strings, and the frets are leveled and milled here at our shop in California for a nice smooth and clean feel all around. The PHRED instruments Brown Wolph gets its inspiration from Doug Irwin's Wolf guitar, one of the iconic guitars played by Jerry Garcia. 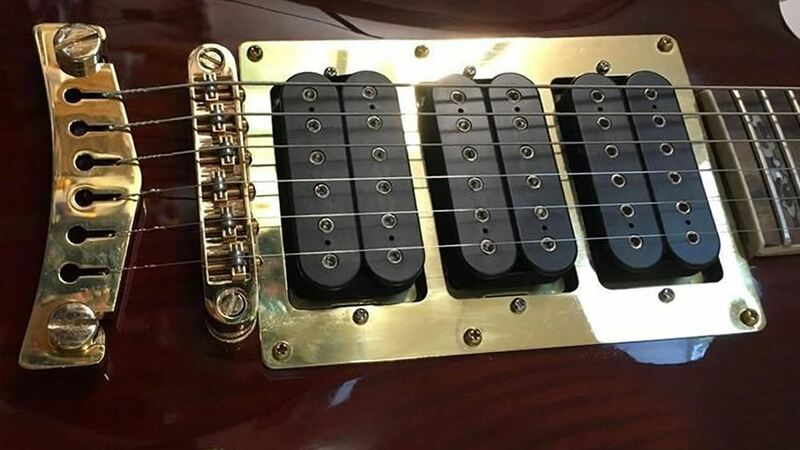 The body features a triple humbucker setup mounted in a custom pickup plate, with discrete split coil switches and a 5-way pickup toggle for 14 different tone combinations! Our Brown Wolph is professionally setup with low action and D'Addario 10-46 strings, and the frets are leveled and milled here at our shop in California for a nice smooth and clean feel all around. The PHRED instruments Dire Wolph gets its inspiration from Doug Irwin's Wolf guitar, one of the iconic guitars played by Jerry Garcia. The body features a triple humbucker setup mounted in a custom pickup plate, with discrete split coil switches and a 5-way pickup toggle for 14 different tone combinations! Our Dire Wolph is professionally setup with low action and D'Addario 10-46 strings, and the frets are leveled and milled here at our shop in California for a nice smooth and clean feel all around. The PHRED instruments Scarlet Wolph gets its inspiration from Doug Irwin's Wolf guitar, one of the iconic guitars played by Jerry Garcia. The body features a triple humbucker setup mounted in a custom pickup plate, with discrete split coil switches and a 5-way pickup toggle for 14 different tone combinations! Our Scarlet Wolph is professionally setup with low action and D'Addario 10-46 strings, and the frets are leveled and milled here at our shop in California for a nice smooth and clean feel all around. Buy with monthly payments and get more time to pay. Look for the 'Check out with PayPal' button at checkout. Subscribe and become part of our community. Be the first to hear about our latest offers and discounts! Copyright © 2019 PHRED instruments, LLC. All rights reserved.